Top Tax Defenders went above and beyond for me. They maintained a level of professionalism while being very friendly. They addressed all of my questions and concerns and were extremely knowledgeable about all areas of tax preparation. I look forward to working with them again in the future. I would like to commend and recommend Top Tax Defenders to anyone with tax problems. They were very professional, communicative and resolved our long-standing tax problems quickly. I couldn't be more pleased!! We just paid a fraction of what was owed. Thank you. [They were] very helpful and professional in answering all of my questions. Thanks Top Tax! Quick note about how pleased I am with Top Tax Defenders. I rec'd a Penalty Notice from the IRS for late filing of my family's (very small) Partnership Return for tax year 2013 for $11,700! As Tax Matters Partner I had neglected to mail the return in on time; even though all of the K-1's were distributed timely. This was the very first such occurrence in 20 years. I immediately called TTD and spoke with a phone screener who wasn't very positive and suggested that I work-out a payment plan with the IRS. Admittedly, Partnership returns are a specialty area. The next day, I rec'd a call from Doug M at TTD who had reviewed the initial notes of my call. Doug advised that TTD might indeed be able to help, but further indicated that I might be able to have the IRS waive the penalty myself. So instead of writing the IRS a check for partial payment, I called them. And sure enough, TTD was right! After waiting for just 20 min to speak to an I RS rep, I was able to have the penalty completely removed! I can endorse without hesitation TTD to all your listeners. They really cared about me and fixing my situation, with or without their professional services! TTD is definitely a firm I trust and will use again if the occasion arises. 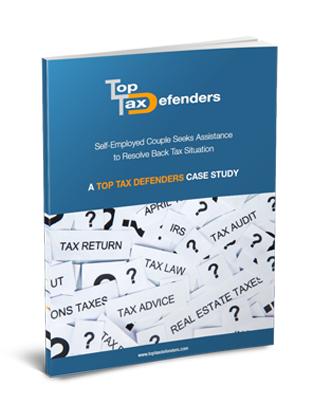 Learn how one couple worked with Top Tax Defenders and lowered their owed back taxes.